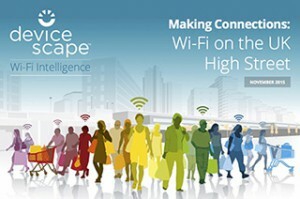 The report, ‘Making Connections: Wi-Fi on the UK High Street’, is the first in Devicescape’s new ‘Wi-Fi Intelligence’ research series. Devicescape set out to compile a list of the top high street brands for free Wi-Fi, taking into account quality, accessibility, and usage. Drawing on fully anonymised data from a sample of more than 100,000 Devicescape-enabled smartphones, Devicescape sampled the free Wi-Fi at a host of leading brand locations across the UK where those smartphones connected. While free Wi-Fi might be associated most closely with coffee shops keen to attract nomadic workers, the report shows just how widespread and high quality Wi-Fi on the UK high street has in fact become. Devicescape found that brands from the retail and ‘food on the go’ sectors offered the best quality Wi-Fi during the survey period, followed by restaurants, banks, and coffee shops. As well as being among the leaders for quality, Marks & Spencer emerged as the most interconnected brand on the UK high street. More devices that connected to Marks & Spencer Wi-Fi during the survey period were found to have also connected to the Wi-Fi at other high street locations than was the case for any other brand. The brands named in this survey were drawn from the 40 brands whose Wi-Fi was most frequently connected to by the Devicescape sample user base in the UK over the course of July 2015. In each data point in the report only the top set from the surveyed collection was included. The absence of a brand from any particular data point, or from the report as a whole, does not, therefore, constitute a negative judgement on that brand. For the purposes of the report Devicescape has omitted municipal networks and Wi-Fi provided on public transport. The term ‘High Street’, for the purposes of the report, covers a range of popular retail and leisure destinations, including large malls and transit locations such as stations and motorway services. The data gathered for this survey was fully anonymised. Devicescape did not capture or store any personal identity information.